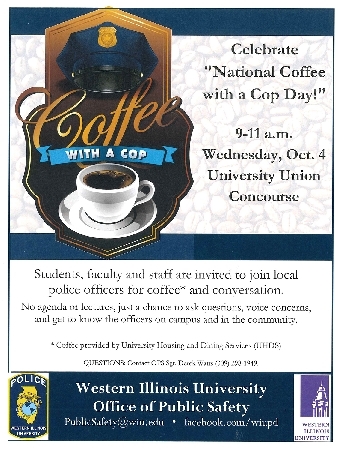 MACOMB, IL – The Western Illinois University Office of Public Safety (OPS) will host "Coffee with a Cop" from 9-11 a.m. Wednesday, Oct. 4 in the University Union Concourse. The event is designed as a way for members of the campus community to come together with local law enforcement officers to ask questions, voice concerns and get to know the officers. Officers from OPS will attend the event, as will representatives from the Macomb Police Department, McDonough County Sheriff's Department and the District 14 Illinois State Police. According to OPS Sgt. Derek Watts, coordinator of the program, the on-campus initiative, the majority of contacts law enforcement has with the public happen during emergencies or emotional situations. Those situations are not always the most effective times for relationship building with the community, and some community members may feel officers are unapproachable on the street. "Coffee with a Cop" is a national initiative supported by the United States Department of Justice. The WIU Coffee with a Cop Event is co-sponsored by University Housing and Dining Services, who will provide the coffee. For more information, contact OPS at (309) 298-1949.